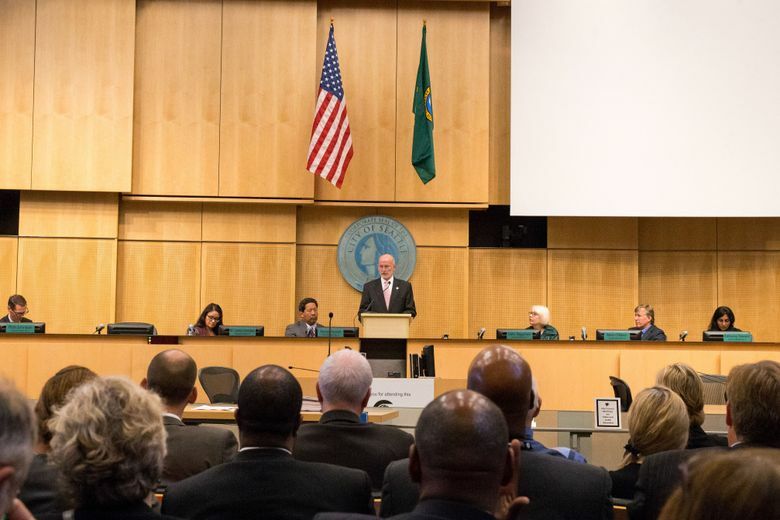 Seattle Mayor Tim Burgess proposed a 2018 budget Monday that would boost money for homeless services and respond to a surge in spending on claims and lawsuits against the city. 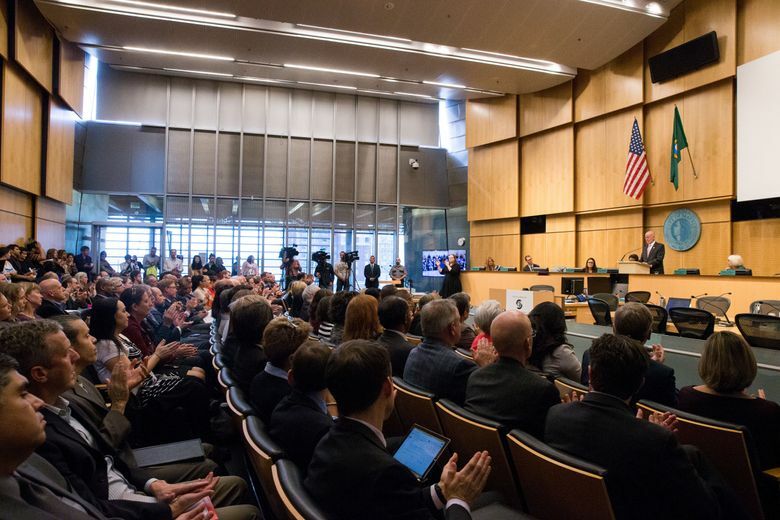 Seattle would again boost its spending to combat homelessness under a proposed 2018 budget Mayor Tim Burgess delivered Monday to the City Council. The package calls for spending $63 million on homeless services next year, up from about $61 million this year and $39 million as recently as four years ago. The council is expected to make changes to the budget before voting on it Nov. 20. Under the proposed budget, the city would continue to increase its police force while using modest revenue increases to help offset a surge in spending on claims and lawsuits — an issue that could heat up this fall’s race for city attorney. Seattle is spending $12 million more than it anticipated this year to defend and settle cases brought against the city, according to Budget Director Ben Noble, with some of the money going to outside attorneys who contract with the city attorney’s office. “We’re seeing more cases and larger cases, liability cases in particular,” Noble said, adding that the trend is expected to continue next year. The budget proposed Monday was mostly put together under Ed Murray, who resigned as mayorSept. 12 amid allegations that he had sexually abused teenagers decades ago. The document issued by his successor hews closely to the 2018 budget projections that Murray and the council endorsed last year. 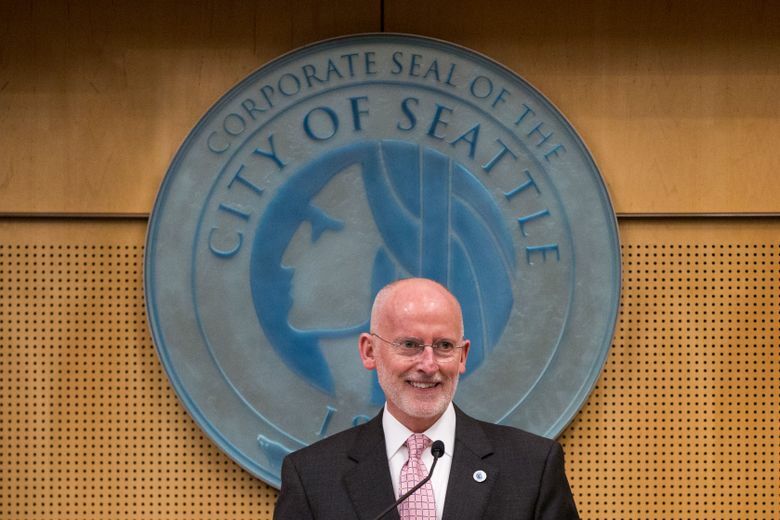 Burgess was a council member until last week, when his colleagues selected him to serve as mayor until the results of the Nov. 7 election between Cary Moon and Jenny Durkan are certified. The temporary mayor alluded to the Murray scandal in his budget speech, referring to “the painful crisis of the last months.” Murray has denied the allegations. The proposed 2018 budget includes $500,000 in additional spending to support survivors of sexual abuse. Overall, it calls for a “marginal” increase in spending compared to 2017, Noble said. It would total $5.6 billion, including $1.26 billion in general-fund spending. Seattle’s economy is strong, and the city’s tax revenues are growing along with it, Noble said. But the growth is slowing somewhat, he warned. The existing team — specially trained police officers, a mental-health professional and outreach workers — help people living in unauthorized encampments throughout the city. The new team would focus on people living in vehicles, Burgess said. The city’s new tax on sugary beverages takes effect in January, with the money reserved mostly for education and nutrition programs. And some statewide changes, such as the elimination of a sales-tax break for bottled water, will bring Seattle additional revenue, Noble said. That money — and some underspending by city departments — is how the city plans to deal with the higher-than-expected spending on claims and lawsuits, the budget director said. The city needs to come up with $12 million to plug this year’s gap, while the new budget calls for a $1.4 million hike. The proposal refers to spending on claims and lawsuits as “one of the most significant emerging budgetary challenges” for the city’s general fund and says the budget office will coordinate a comprehensive review of the issue next year. “How much of the deficit is attributable to outside counsel spending? What is the city attorney doing to bring those costs down?” Lindsay asked in a statement. The spending this year has included liability cases, such as those stemming from traffic accidents, Noble said, and lawsuits brought against groundbreaking laws. Several new Seattle laws have recently been tested in court, including measures boosting the city’s minimum wage and allowing Uber and taxi drivers to unionize. Burgess’ budget sets aside $200,000 to begin setting up retirement accounts for the estimated 200,000 Seattle workers whose employers don’t offer them.